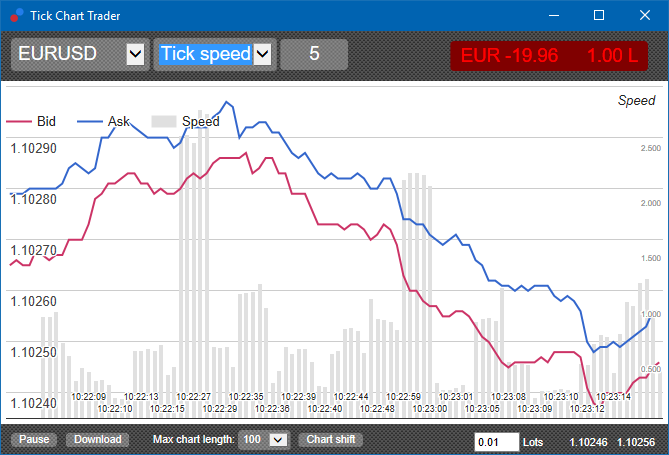 The tick chart trader is an application showing tick charts in a wide range of styles, that allows quick trading using either a keyboard or mouse. A tick chart is compiled from the time that the application starts running. It does not provide access to the previous tick data. Tick chart trader enables tick chart functionality. Tick charts show each change in the bid or ask price and update their tick data whenever there is a change in either the bid or ask price. The amount of time between each point on the chart can vary depending on how active the market is. specified by the numeric field in the toolbar. For example, it can display the average speed of the last five ticks. The smaller the grey bars, the faster the ticks appear. These show each individual tick. The X-axis of the chart is divided into equal periods of time. This way, the chart can show bursts of activity between periods where the lines are flat from lack of new ticks. This shows traditional candles, with an Open, High, Low and Close. The difference is that the tick candle chart is based on a number of ticks, rather than a duration of time. it could represent as much as a minute if the market is quiet (i.e. it takes 60 seconds for five ticks to happen). Note: candle charts are based on the mid price of each tick (i.e. the average of the bid and ask). These show the activity on one symbol versus another, plotted against each other. The versus chart shows the current mid prices and historic snapshots made every second. A chart of two different symbols plotted against each other, shows the correlation in their movements. In the example below, there is a strong positive correlation between the two symbols. A chart of a symbol against itself is equally useful. It shows the current price in relation to the high-low range of the period covered by the chart. the sell closes the previous buy. This even works when you use a trading platform like MT4, which allows hedged orders. The trading functionality in the tick trader application is designed for people who want quick entry and exit, from a single position in each symbol. You can place buy and sell orders by clicking on the bid and ask prices in the bottom-right of the application. A pop-up panel will appear, with buy or sell pre-selected depending on whether you clicked on the ask or bid price. 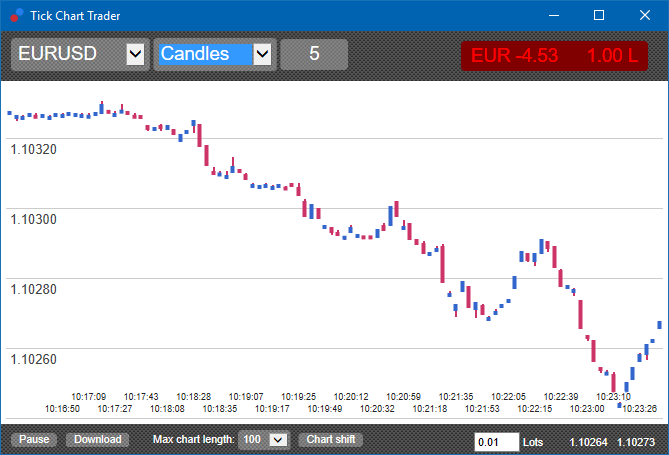 The application also remembers the size of the most recent trade, which you placed for each symbol. You can close an open position by clicking on the position/profit marker in the top-right of the application. the panel will be pre-filled with a sell order of 0.30.
change that to a buy order before placing the trade. You can close the panel without placing a trade, by clicking anywhere outside it. You can trade with a keyboard using the B, S and C keys. Bis equivalent to clicking on the ask and it pre-fills the dealing panel for a buy order. S is equivalent to clicking on the bid and it pre-fills the panel for a sell order. C is equivalent to clicking on the position/profit marker. press the spacebar instead of clicking on the Place order button. You can move from the Place order button to the volume field using the standard keyboard shortcut of shift+tab. You can close the panel without placing a trade by pressing the Esc-key. For extra-fast order entry, you can use the ctrl-key. You need to turn this option on by using any of the above facilities to open the dealing panel. You do not need to place a trade. You can turn on the ctrl option and then cancel the dealing panel. 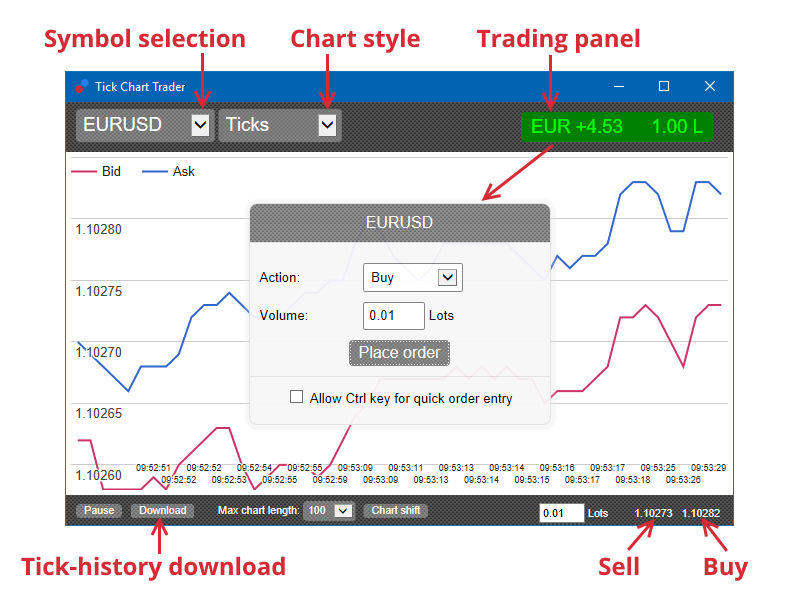 Using the ctrl-key is equivalent to opening the trading panel and clicking on the Place order button without changing the pre-filled settings. pressing ctrl+S or ctrl+clicking on the bid price, places a new sell order using the most recent trade size. You can change options and settings of the application using the controls in the bottom-left corner of the window. the volume of tick history recorded for symbols which are not currently displayed. it will be recording an unlimited number of ticks for EUR/USD. In this case, you can change the value from 100 to 200 to see more of the EUR/USD history (provided that 200 ticks have been received). 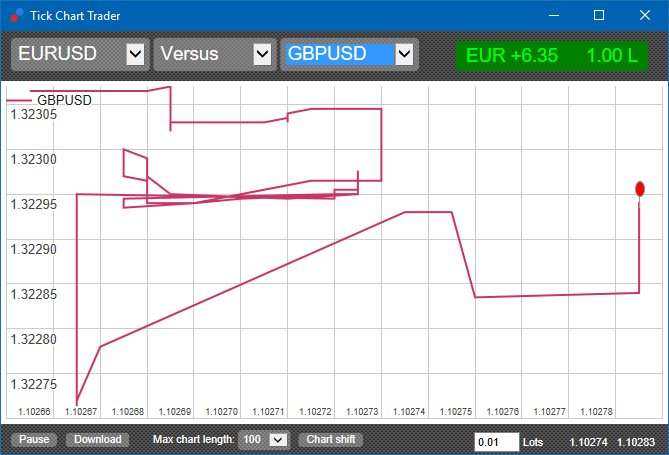 However, the software will only be storing the most recent 100 ticks for any other symbol that is not being displayed (like GBP/USD). The Pause button suspends drawing of the chart. 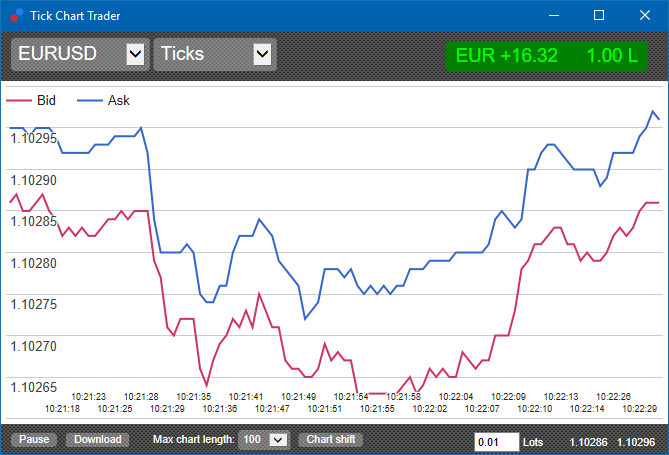 The software continues to collect ticks, plus updates the current price and the position/profit marker. The Download button downloads the entire available tick history for the selected symbol as a CSV file, showing the date, bid and ask prices. Feel free to visit our YouTube channel, which represents live trade recordings, tutorials and playlists of extension-highlights from Admiral Markets UK Ltd.